It was a great privilege and honor to follow three generations of the R & C Family yesterday and capture some everyday-living snapshots of them in their beautiful yard and home. What a blessing to have five beautiful grandchildren age 5 and younger! They alone made the day quite exciting! They laughed and played. They read books and had snacks. Rain fell while we made our own sunshine. Just being together was a gift–their real presence in the present. Thank you for having me shoot you all during your precious moments! This entry was posted in babies, Children, Lifestyle, Relationships, Senior Citizens, Snapshots and tagged babies, child's play, Children, collage, Fall, Families, generations, natural light, Relationships, Snapshots of daily life, St Louis area photographer of families and children, summer, Toddlers. Bookmark the permalink. 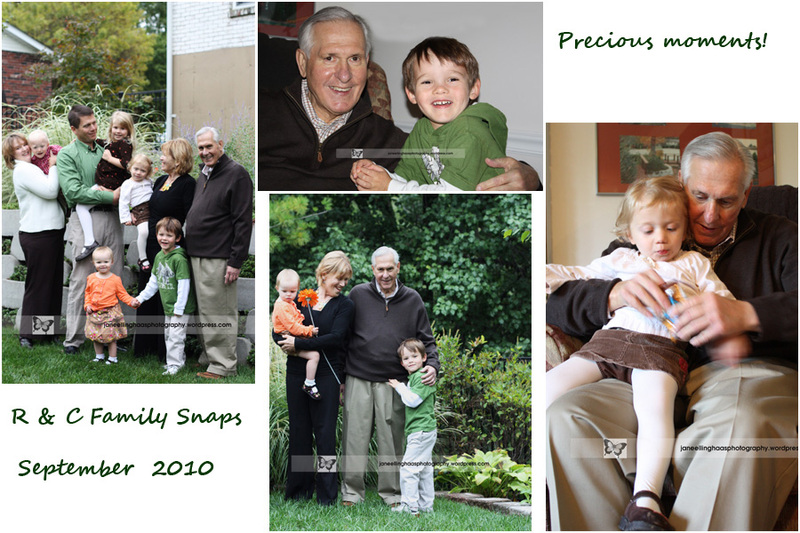 Beautiful photos – enjoy seeing such a lovely, and loving, family!!!!! !